The Lean Startup is a business approach that is synonymous with the work of Eric Ries (who has also published a book called The Lean Startup) and Stanford professor Steve Blank. It describes a new approach for startups and prescribes behaviours they should adapt to increase the likelihood that they will succeed. While the concept is best suited in a technology or Internet context, it has a wider application for all startups. So what are the key tenets of the approach? This theme is echoed by Ries who describes how a startup has to focus on discovering a viable business model while operating in a climate of ‘extreme uncertainty’. Framing a startup in this way helps shift the focus to a more scientific approach where activities undertaken are viewed as tests that quickly help you validate assumptions (or otherwise). Given that you are in research mode, it is important to embrace some simple processes to ensure the search for a scalable business model is an efficient one. In many ways, these are lessons in hyper – efficiency, where time and money is precious and the basis for informed decision making is primarily on the back of building what they call a Minimum Viable Product (MVP). An MVP is a basic version of the product that can be sent to some customers (ideally early adopters) who will give you feedback which will help you decide what to do next. In effect Ries is suggesting that you look for ‘evidence of demand’ before building the complete product, and an easy way to test for this is to observe real user behaviour on say, a web page. Every click on a button signals intent, regardless of whether or not the product in the back end is there or not, and this data helps you assess likely demand. 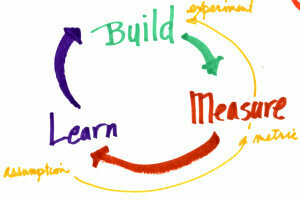 The following represents a brief description of some of the main concepts associated with the Lean Startup approach. As the above example of the MVP approach demonstrated, they advise that you don’t build an elaborate product before you have undertaken numerous tests along the way (They are big advocates of A/B testing). Eschew focus groups and watch how real customers behave. Getting the MVP into the hands of real customers early on and quickly learning from what they do underpins their entire methodology. Avoid vanity metrics i.e. 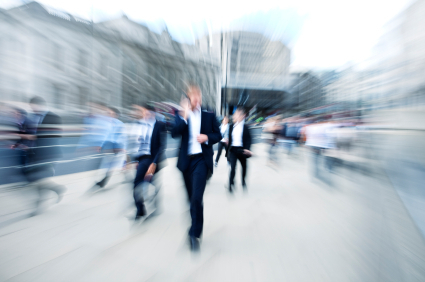 metrics that create a favourable impression about performance when they are illusory. For example: what good is 1 million page impressions if none of them convert? Instead entrepreneurs need to focus on actionable metrics i.e. real metrics which can inform decisions. The recommend you pivot or stop what you are doing if the initial plan is not working (and your findings support the view that changing tack is more likely to be successful than continuing with the original plan). This view is of course very much consistent with the views of business planning guru John Mullins as described in his book Getting to Plan B. Generally Accepted Accounting Principles (GAAP) has underpinned financial accounting for many years. However, Ries argues that Lean Startups need to embrace ‘innovation accounting’ before they get to the point where traditional accounting kicks in. With this method he suggests that progress is best tracked by observing things like user activity, engagement, retention and virality. In other words, if user numbers are increasing, and they are being retained such that Life Time Value (LTV) is growing significantly, this is a better indicator of ‘progress’ than traditional accounting methods. The word ‘lean’ refers to speed and agility and not ‘cost savings’ as some readers misinterpret (although that said, they are against waste ‘of all guises’). Again Ries is recommending that startups take advantage of the discovery mode to quickly learn what is not working so they can make changes immediately. For me, I feel that regardless of the concept, people will always find flaws and have strong counter arguments to certain elements of the approach. Awareness of these arguments helps entrepreneurs make more informed decisions regarding whether or not they embrace alternative approaches. They are merely opinions after all. If you are an Internet or technology based startup the lessons will be ones that are likely to resonate. The Lean Startup approach is certainly one which will help you instill early on the need for decisions to be based on scientific facts (as much as possible) and that given the extremely difficult conditions start-ups operate in, that an ability to learn quickly and change tack are lessons you would do well to bear in mind. I for one have been converted to their way of thinking.